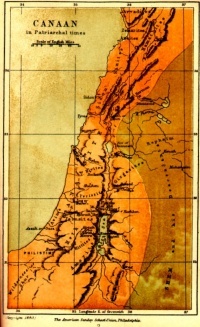 Map of Canaan during the time of the Patriarchs. Canaan (Phoenician: 𐤊𐤍𐤏𐤍, Kānāʻan; Hebrew: כנען, Kānāʻan; Greek: Χαναάν, Chanaān; Arabic: كنعان, Kanaʿān; "Name means::humiliated") is an ancient name that can refer to Canaan, the fourth son of Ham (the son of Noah) and his descendants—the Canaanites—or the region to the west of the Jordan River and the Dead Sea covering all of Palestine, where the Canaanites once dwelt known as the Land of Canaan as defined by the Old Testament as well as Egyptian and Phoenician documentation. Canaan (Hebrew: כנען, Kānāʻan) was the fourth son of Son of::Ham (the son of Noah). He is the progenitor of the Progenitor of::Canaanites. After the Global Flood, Noah planted a vineyard and made wine but became drunk. While intoxicated, an incident occurred involving Noah and his youngest son, Ham (the father of Canaan). As a consequence of Ham's transgression of "seeing the nakedness of his father", Noah cursed Ham's son Canaan and his descendants to a life of servitude to his brothers (Genesis 9:20-27). This page was last modified on 23 August 2010, at 03:37.